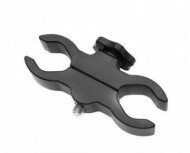 The Klarus MGM3 is an offset metal weapon mount that is designed to be compatible with a wide variety of Klarus flashlights. This weapon mount attaches firmly and securely to standard picatinny rails and leaves your flashlight in an off center fashion for tactical or hunting lighting purposes. The MGM3 is compatible with all Klarus XT models, as well as most LED flashlights with a 1 inch diameter body tube.